Irritable bowel syndrome is a serious and often embarrassing condition that can cause major disruption to the lifestyle of sufferers. Characterized by severe abdominal pain, bloating and irregular bowel movements. The cause of this functional gastrointestinal disorder is still largely unknown. How do you know if you have IBS? 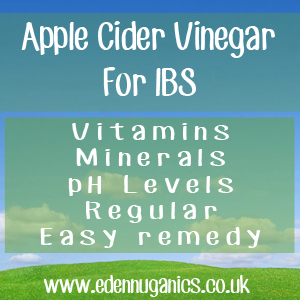 How is Apple Cider Vinegar useful for IBS? Apple cider vinegar is a fermented liquid that has been used as an all-purpose health tonic for centuries. Regular consumption of ACV is known to help our bodies in a number of ways, one of which being the ability to reduce inflammation throughout our intestines. In addition, ACV also contains a full spectrum of natural vitamins and minerals that help to keep us regular and avoid constipation. How to use the ACV? The best and most popular way of including ACV in your diet is mixing it with warm water and honey for a great tasting drink that can be enjoyed every morning before breakfast. Heat water in a pan. Be sure not to allow the water to reach boiling point as this would damage the delicate enzymes found in vinegar. Next, add honey to the warm water. Without honey, apple cider vinegar has a somewhat tart taste. Now it's time to add our raw, unfiltered apple cider vinegar to the mixture. Be sure to give it a good stir. The last step is to add this to your favourite mug and enjoy your morning, safe in the knowledge that your body is being looked after from the inside out. What type of ACV should I use? When using ACV for its healing properties it is very important to only use apple cider vinegar that has not been processed. Look for words like 'raw', 'unfiltered' and 'containing mother' on the bottle to ensure it is naturally produced. Avoid problem foods - In some cases, IBS can be triggered by a sensitivity to certain foods. Some foods that commonly cause issues include: alcohol, chocolate, caffeinated beverages such as coffee and sodas. Eat at regular times - By not skipping meals and trying to eat at the same times each day we help our body to digest food better and become more regular. Try avoiding Dairy - Lactose intolerant or not, some people struggle to digest and process dairy products. If you're suffering from IBS it is a good idea to experiment with cutting out dairy from your diet. Regular Exercise - Exercise helps to stimulate regular contractions of your intestines as well as helping to relieve stress and depression. Try adding more fibre to your diet - Fibre is a great way to fight constipation and is easy to include in your diet. Some of the best natural sources of fibre include: whole grains, fruits, vegetables and beans. Can Apple Cider Vinegar Treat Gout?